SANDWICH - Everett B. Horn III, 65, died at home on Jan. 7, 2016, surrounded by his family. Born on July 28, 1950, in Cambridge, Everett grew up in Needham and graduated from Needham High School. He then went on to receive his B.A. from American International College in Springfield. After college, Everett moved to California where he worked in the insurance industry. He returned to Massachusetts and went to work for the Colonial Gas Co. in 1980, retiring in 2013 after 33 years. He also became a representative and board member of the Cape Light Compact. Growing up, Everett's family spent every summer in West Hyannisport, and enjoyed many happy days at Craigville Beach. After college, he enjoyed boating around Nantucket Sound and spending as much time as possible on the water. In 1983, he married Pamela J. 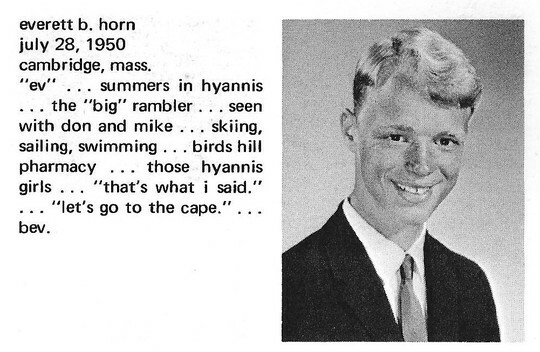 (Horne) Horn, a fellow enthusiast of summers on Cape Cod and later purchased a permanent home in Sandwich where he would raise his three sons. He set a wonderful example for his children by contributing to the community, teaching Sunday school at St. John’s Episcopal Church, and as the Scoutmaster of Boy Scout Troop 47, in which his kids were quite active. Additionally, he was a Mason in the Dewitt Clinton Masonic Lodge. Besides his wife, Pamela, he is survived by sons Everett B. Horn IV and his wife Stephanie, William D., and Peter R. and his fiancée Kathryn, who are together expecting Everett’s first grandson. Visiting hours will be from 4 to 7 p.m. Monday, Jan. 11, 2016, at Nickerson-Bourne Funeral Home, 154 Route 6A, Sandwich. A memorial service will be held at 10 a.m. Tuesday, Jan. 12, at the St. John’s Episcopal Church, 159 Main St., Sandwich. In lieu of flowers, donations in Everett’s memory may be made to the American Cancer Society at donate.cancer.org. Rest in peace my friend and Brother Mason. Everett was a great guy and a buddy I loved getting in trouble with at Pollard and NHS. RIP Everett my friend.